Is art a waste of time? If it can’t be used or sold, what is it? 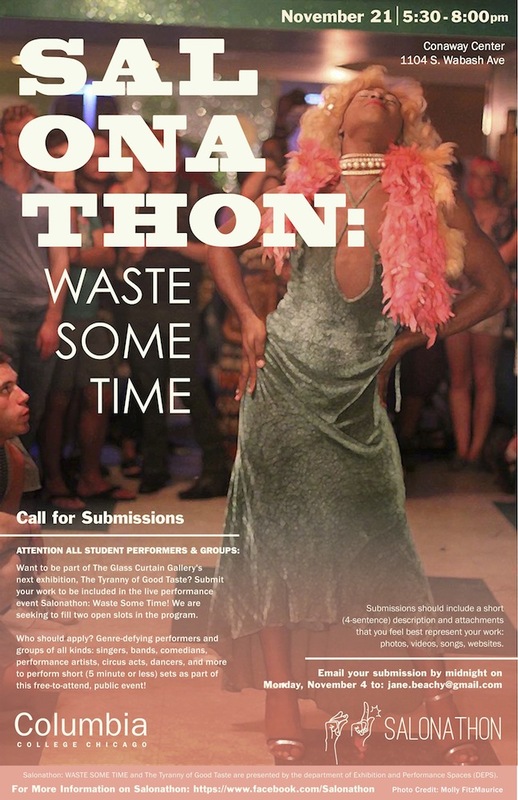 In conjunction with curator Danny Orendorff’s exhibition The Tyranny of Good Taste at the Glass Curtain Gallery, Salonathon comes to Columbia College to investigate these questions.This live (and FREE!) event features some Salonathon favorites as well as some student talent from Columbia: Dav Yendler, Kiam Marcelo Junio, Les Soubrettes & The Haines Sisters, Medicine Women, Raul Alvarez, Sid Branca, Shea Coulee, Witch Hazel, and You-C.
View one of the night’s highlights (and finale performance!) below – Narcissus by Les Soubrettes & The Haines Sisters! Let’s Make a Mess: Panoply Performance Laboratory, Future Death Toll & C.A.S.H.E.D. 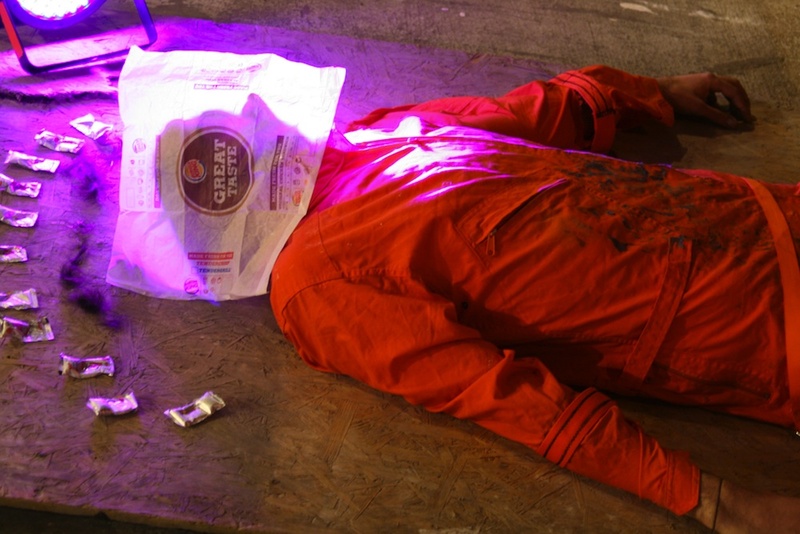 Charlotte Street Foundation proudly hosts Panoply Performance Laboratory, Future Death Toll, and C.A.S.H.E.D. for Let’s Make a Mess, an evening of upwards of 20 performances over two hours, created in response to the current exhibition The Tyranny of Good Taste at la Esquina. Download Full PR as PDF. Dumpster-diving their way across mid-America, this multi-disciplinary tag team of artists will present responsive and relational performances, including body art, found objects, industrial noise music, and “low-brow” consumer waste (American cheese, stale donuts, hot glue, and wax). Reacting to the economic plight of artists working today, “Let’s Make a Mess” includes work that desperately and auto-poetically poses a politics that embraces non-dominant schemes for value, culture, and reality at large. SCROLL DOWN to view additional images of this event.